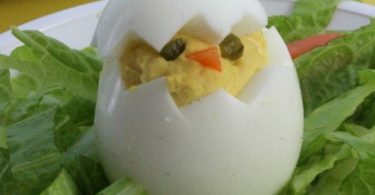 Here are 15 of the coolest, most creative ideas we’ve found so far in our search! As experts in the world of horticultural design, we know how difficult it can be for modern companies to stand out in today’s crowded marketplace. If you want to get ahead of the competition, you need an image that inspires your audience, and the right resources to share your visual values with the world. 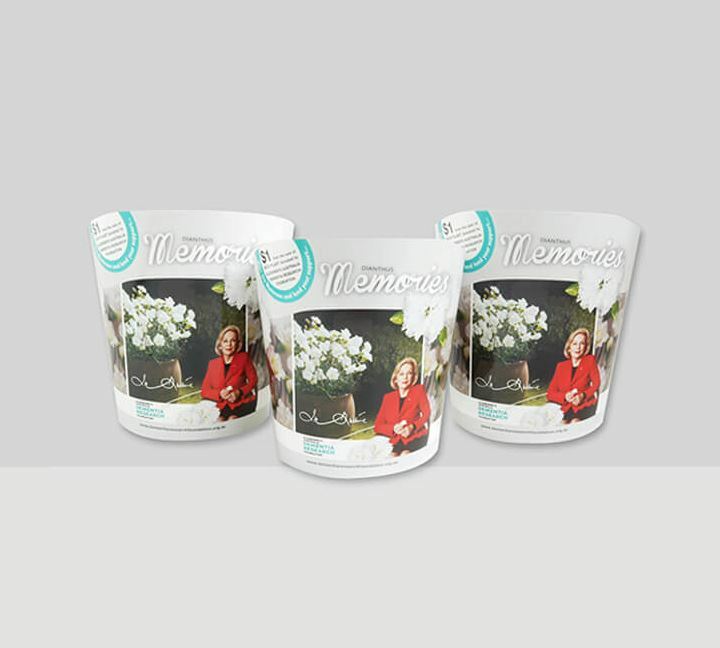 Our unique packaging design solutions could be the key to transforming your company and giving your business the attention it deserves. We’re proud to serve our customers with countless incredible images, all carefully chosen for their quality, and visual impact. Have you ever opened up your kitchen cupboard and had a can of soup come rolling out, making your life flash before your eyes? It seems no matter how we stack out cans (look, our kids really like chicken soup), they seem to teeter off each other or take up all the space on the entire shelf. 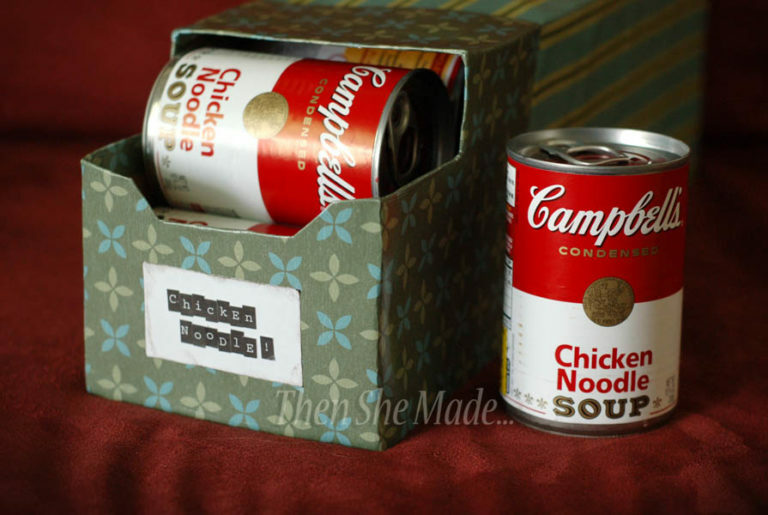 That’s why we were pleasantly surprised to come across this can storage idea from Then She Made that keeps the soup cans contained and space efficient while also upcycling a soda pop box once you’ve drank all the soda! Recently, our kids came home with tiny seedlings planted in little miniature pots that they’d been learning about at school, but rather than forgetting about them like some kids would, ours decided they wanted to actually watch their plants grow for as long as they could. The plants soon got too big for their mini pots, however, but the next size up planters we could find were ridiculously large in comparison. That’s why we were pleased to come across this little upcycled seed planter tutorial from Homedit! 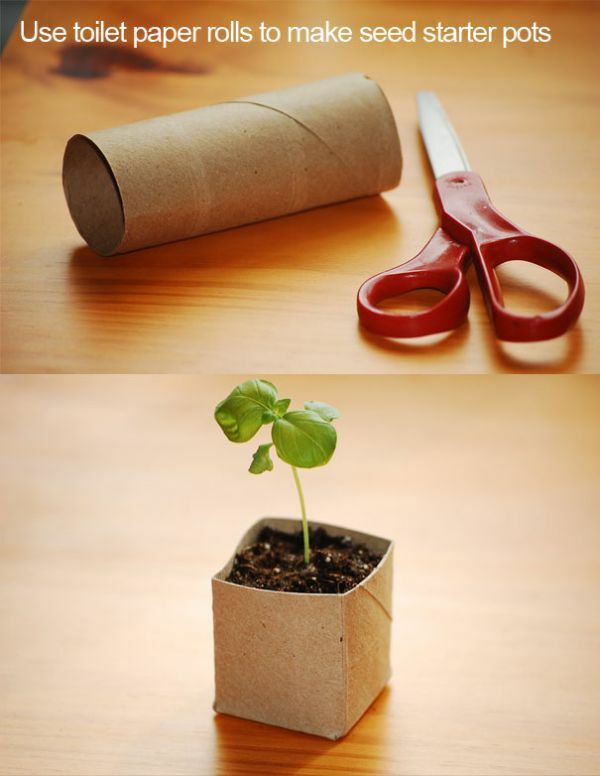 Planting your flowers in a section of an old toilet paper roll also makes it easer to replant them later when you want to put them in the garden. Okay, we know that they actually already make drawer inserts intended for organization, but we’ve tried store bought storage trays of all kinds and, as it turns out, our desk is actually just a little smaller than the average writing desk with a drawer. This means that the regular organizers we’ve come across won’t fit! 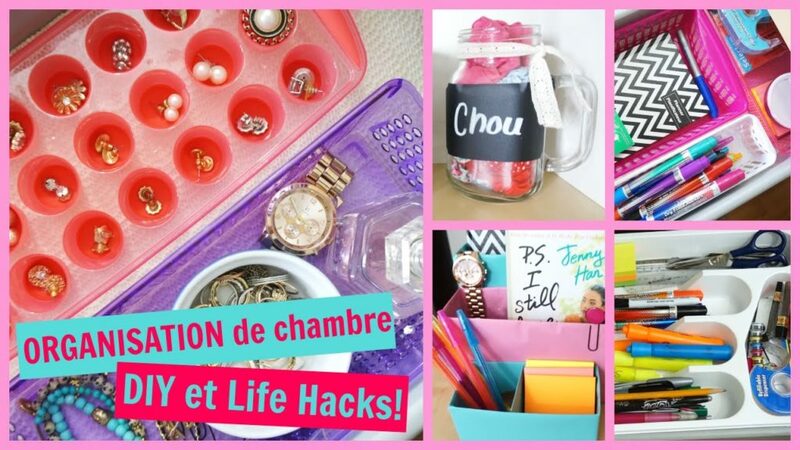 Instead, we followed this suggestion from Amelie Barbeau and used small ice trays placed next to each other inside the little drawer, putting different earrings, rings, and bracelets in each little cubby to keep them organized. Recently, we hit the breaks in our car a little harder than usual because a cat ran into the road and everything was find because we stopped in time for the cat to run away, but all the car fluids and supplies we had in the back of the car got shaken around by the force and flew all over the trunk, so we had to put them away before we could fill the trunk up with our groceries half an hour later. Since then, we’ve discovered this awesome, simple little life hack from DIY Craft Project. If we’d put our bottles of windshield fluid and so on in a shower caddy, the caddy might have slid a little when we hit the breaks hard, but the bottles would have stayed contained! We’re constantly looking for simple, space efficient ways to clear our pantry shelves out and make more space for all the snacks our kids are constantly convincing us to buy for them, but so many of them come in unnecessarily big boxes! 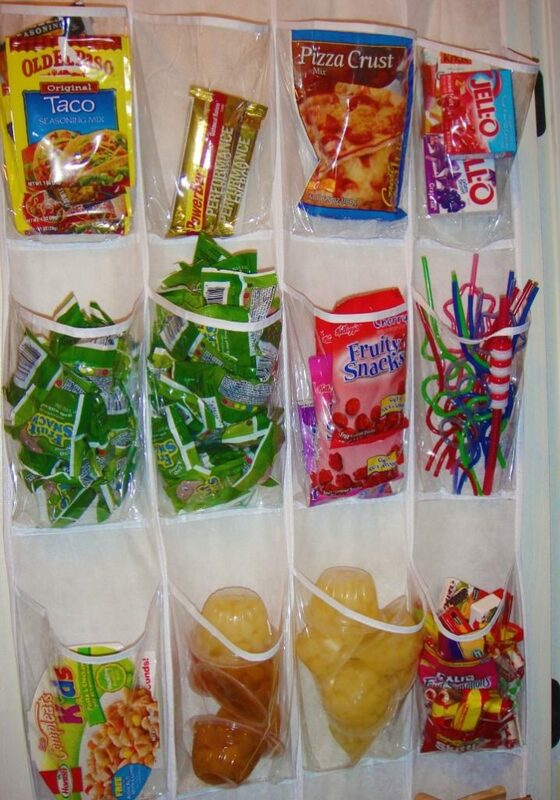 Imagine how excited we were, then, when we came across this idea from Organizing Home Life to hang a shoe rack on the back of the pantry door and put the small, individually wrapped snacks in the pockets of that instead, so you can throw out the larger packaging. This one’s also a big plus because then the kids can reach them easier and won’t have to ask you to get them a snack down from the top shelf! Do you have a big family with kids of all different ages, meaning they also have bikes of all different sizes? Well, if there’s nowhere to put them other than all over the garage floor, we can only imagine how inconvenient that is when you’re trying to actually use to garage for real purposes, like parking the car. 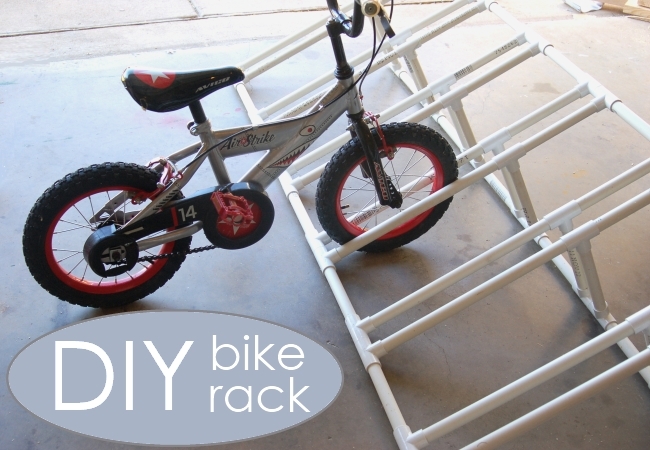 That’s why we thought this DIY bike rack idea from Kids Activities Blog was such a good one! It’s made from simple PVC pipe and quite easy to create, and it’s also pretty affordable! We work from a home office and we’ve often wondered whether there might be a better way to organize our files than just piking them on the side of our desk next to the computer. We had them all in a filing cabinet at one point, but it was kind of a waste of space because we didn’t really have enough files to fill it, plus the files were a lot more inaccessible to reach for when we’re on the phone when we kept them in the filing drawers. 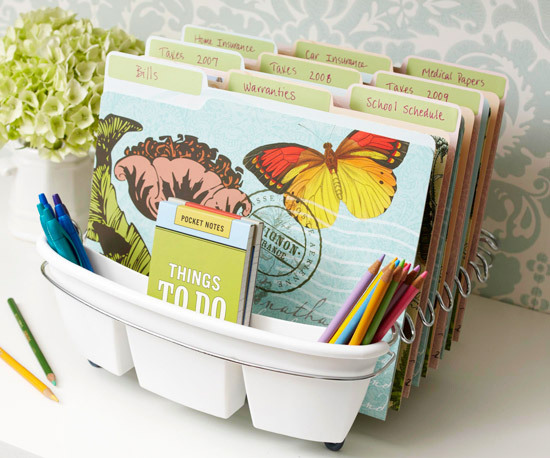 Then we came across this filing idea from BHG and it made things a lot easier! They suggest placing your files like plates in a small dish rack so they stay organized and are easy to grab. We love the way they use the cutlery storage in the rack as a spot for writing utensils! Recently, we bought a pair of super warm, fun looking knee socks for winter because we thought we could brighten up a warm outfit with them, but they turned out to be too small. Instead of throwing them out or putting them in a drawer and forgetting about them, we decided to find fun ways to upcycle them into some kind of clothing pieces for our kids. 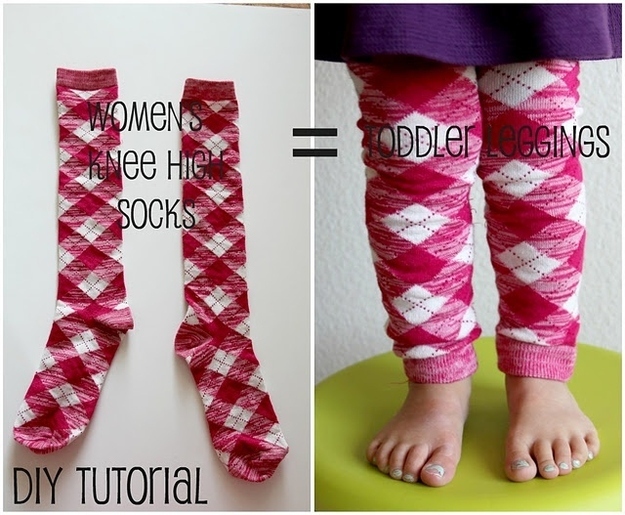 That’s how we found these cute toddler sized winter leggings! DIY Craft Project guides you through the process of making that transformation. Whenever we’ve scrolled by a life hacks blog post on the Internet, we’ve always noticed a few staples that seem to be ideas recycled over and over by different people. Part of us gets tired of seeing things repeated, but the other half of us thinks that they’ must be really useful ideas if that many people have already tried them and still recommend them! So, what’s our favourite idea from those classic life hack ideas, you ask? 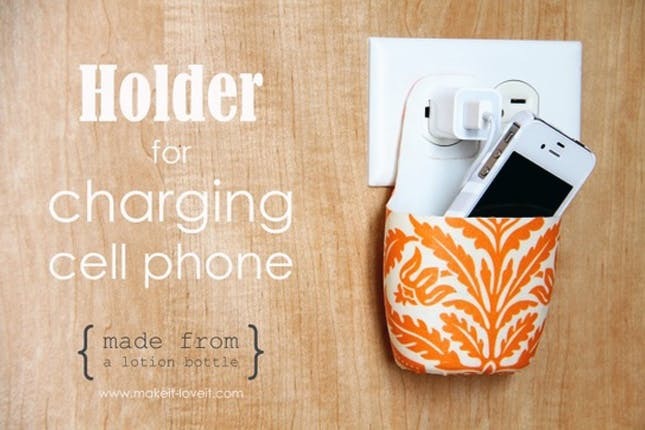 At the risk of sound cliche, we completely adore the idea of creating a phone charging station out of an empty lotion bottle cut in half! Find out how this weirdly crafty and totally useful little device is made on Martha Stewart . 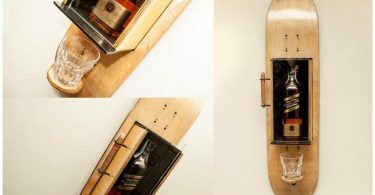 Okay, so we know that this idea isn’t necessarily a life hack, but it’s definitely an adorable decor idea and it does help reduce your environmental footprint by upcycling something that isn’t being used elsewhere! 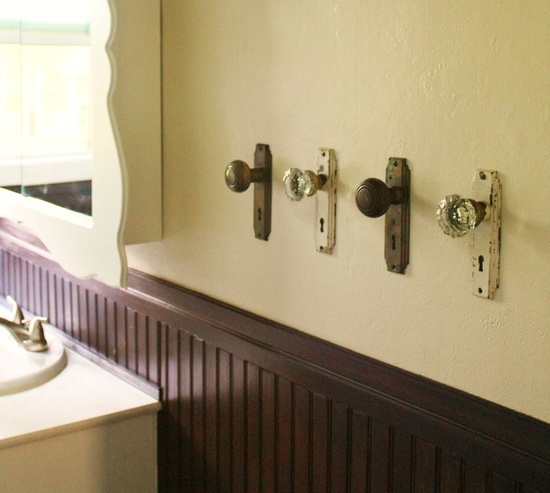 We’re completely obsessed with the way Sublime Decor used old doorknobs to create a row of towel hangers that look rather old fashioned and lovely hanging on the bathroom wall. We also like that you can hang them at whatever height on the wall looks best for you and your kids. Have you ever seen those awesome shower supply hangers that suction right to the wall so you can easily reach your razor or your soap? We have those at home and we appreciate them every day! We can’t help but think, however, that these would be pretty useful just about anywhere that they’ll stick. That’s why we thought this idea from Happy Chappy Brands for keeping your kids amused on long car rides was such a good idea! 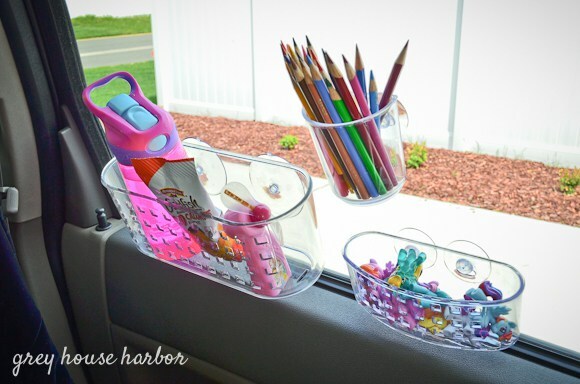 Stick the shower hangers to the window and fill them with little figurines, crayons, or snacks. 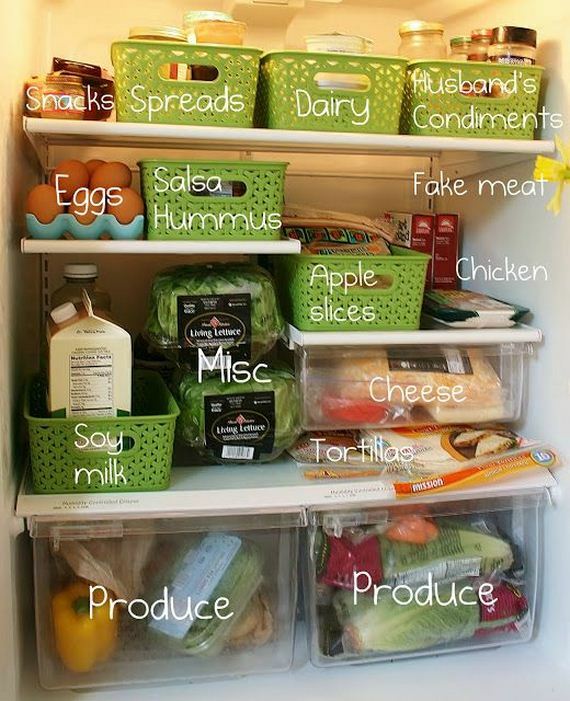 While we’re on the topic of plastic organizers and how useful they can be in all different places, we want to tell you how much we appreciated finding this fridge basket idea from Cheer Crank! We got the baskets that we used to organize at the dollar store on the corner, making them time efficient and affordable to put in, and we organized our stuff just like you see in the picture! We even took it one step further and added little labels using the label maker we got our kids last Christmas because we’re huge nerds. Are your family huge fans of eating outside in the spring, summer, and warm fall, so you often keep plastic or paper dishes around to save the real, fragile dishes in your cupboards from ending up on the cement patio? We keep picnic supplies around too, but we find that if we don’t keep them contained, they just end up spread across the cupboard, getting in the way. 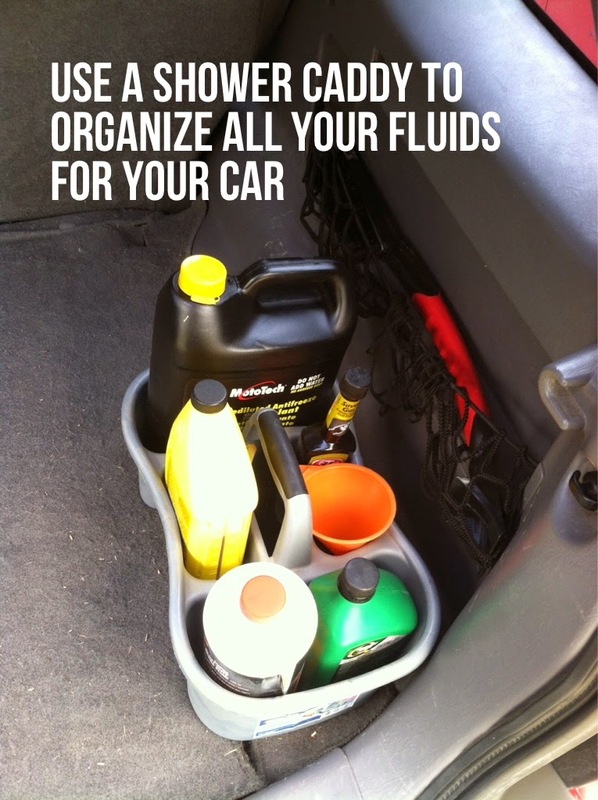 That’s why we liked this simple idea from Organizing Made Fun. 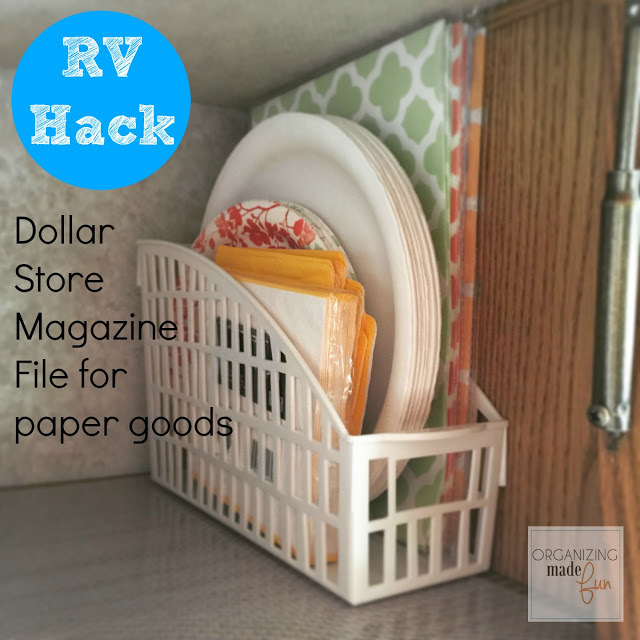 They suggest using a plastic magazine organizer from the dollar store to put everything in and keep it all together, nice and easy to reach for. Do you live in the kind of tiny apartment that has a bathroom so little you can barely fit a towel rack on the wall? Then we think we’ve definitely found an idea that will help you out a lot with keeping things neat and tidy and making sure your towels actually dry between showers! Tips for Women guides you through the process of creating a hinged towel rack out of PVC pipes that fits right behind the door. 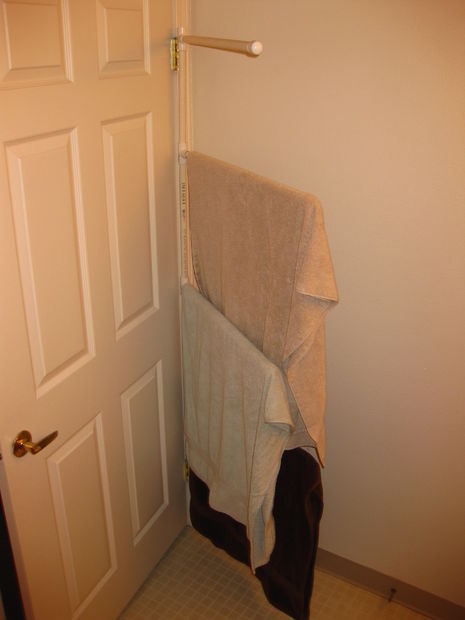 When you close it, you’ll have room to pull the towels away from the wall, but when it’s open they fit flush against the wall so they don’t take up any more space than the door! We’ve talked a whole lot about life hacks that involve making stuff out of other stuff and keeping things organized in your life, but believe it or not, that’s actually not the only kind of life hack that’s out there! 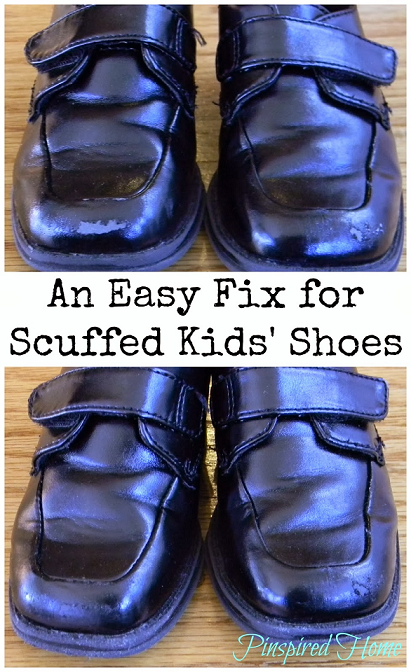 That’s why we just had to make sure to show you this awesome trick for fixing up your kids’ (and probably your husband’s) scuffed dress shoes. Pinspired Home shows you in just a few simple steps how to make them look basically good as new using black crayons!